asked for justice for the wounded and dead. At the WSF we spoke with Chady and Mimun from the Association Fidele pour les Martyres et les Blesses de la Revolution Tunisienne and we visited trade union leader, Mohamed Sghaier, in the town of Kasserine, who showed us the martyrs’ memorial and told us of the weeks of revolution. It was in the poor province of Kasserine in western Tunisia, that the revolution really started. Mohamed Bouazizi, a street seller, set himself on fire on 17 12 2010 in protest against increasing poverty and unemployment. His death lit a touch paper for an explosion of anger at the Ben Ali regime with widespread street demonstrations across the region, and increasing violent repression, with snipers shooting and killing demonstrators. 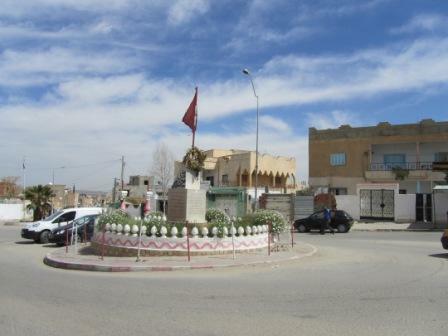 The industrial town of Kasserine was at the centre of the protests and it was there at the Monguela roundabout in the poor quarter of Ezzouhour on 10th January at the funeral of young men killed, that a massacre of mourners took place which triggered protests across Tunisia and led to the fall of the dictator, Ben Ali on 14 th January 2011. Well over 20 people were martyred in Kasserine between 8 and 12th January. The youngest victim was a baby, Yakin Karmazi, who was tear-gassed. Huge numbers of people were injured, particularly young men, not only protesters but local people from the poor areas, for example women and children in a sauna. It is said that Ben Ali was about to bomb the Ezzouhour quarter when he fell. injured have complex and ongoing injuries which they want to have treated with expertise and are demonstrating at the Ministry of Health as they feel they have not been offered appropriate treatment. They campaign with the families of the bereaved for a full enquiry into what happened and to bring the perpetrators to justice. They were the revolution on the streets and deserve not to be forgotten. 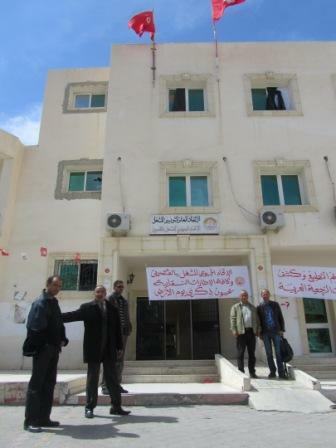 April 22, 2013 in Regional, Tunisia, UGTT.